Go to INVENTORY -> STOCKTAKING to enter the stock taking. In this page you can enter the closing and opening stocks. You can enter both SKUs (ingredients) as well as recipes/sub-recipes. Click ADD STOCKTAKING button to add the stocks as shown below. Stock type can be Closing or Opening Stock type, select the type from the dropdown. Select the Cost Center and Kitchen type (or other categorization as applicable) from dropdown options. This is optional, depending on whether you have created a categorization for stock taking module. You can tag stock takings based on applied categorization. This helps in filtering and listing based on applied tags. If the items are out of stock or cleared, you need to make an entry as zero quantity during stock taking. 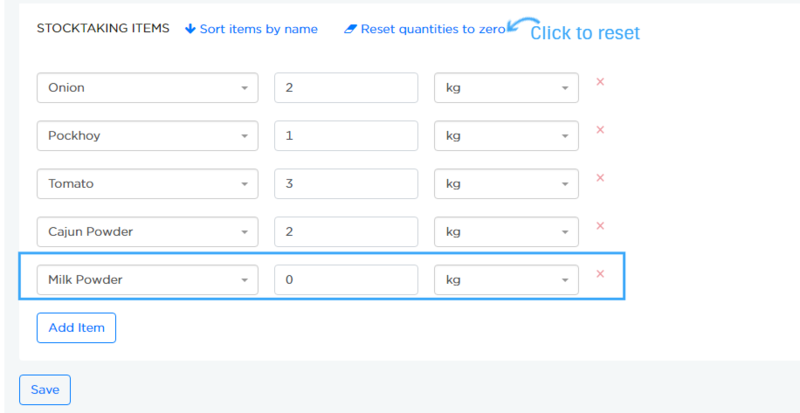 Ensure units entered is appropriate for the SKU or recipe. If you enter a wrong unit, system will not be able to compute the price. This will show up as a warning after you save and can be corrected. You can also enter &apos;non food and beverages items&apos; along with SKUs and recipes, the system will identify if you have configured it in "Validation Configuration" under Settings. You can edit and make necessary changes to the stock taking.